... Energize your Shower with Crystalline Quartz. The Rainshow'r CQ-1000 Dechlorinating Shower Filter provides a long lasting solutions to the problems associated with exposure to excessive amount of chlorine. 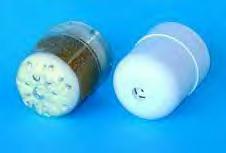 Its specially-formulated KDF filter media effectively removes 90% or more of chlorine from shower water. Once in contact with the KDF, chlorine in the water converts to an environmentally safe and harmless soluble zinc chloride. Rainshow'r CQ is the only filter to include Crystalline Quartz Technology in its media for an energized shower experience. These specially-cured crystals act upon the water to create a softer, more energized shower "feel" and improve both lathering and sudsing. 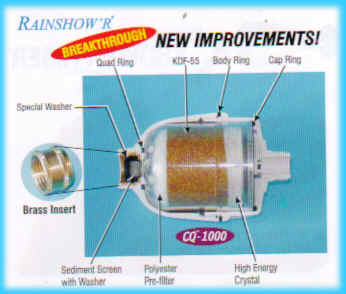 Unlike other dechlorinating shower filters, Rainshow'r CQ-1000 is specially engineered for efficiency and performance. Its unique filter design provides the best shower experience available for you and your family. The new improved CQ-1000 Shower Filter features a solid brass collar molded into the filter body inlet making the filter body so strong even a professional wrestler can't break it. This durable, American made, brass collar is unique to Rainshow'r Shower Filters. Use Teflon tape on shower arm threads for a tighter metal to metal water seal. Now included with Rainshow'r Shower Filters is a TEST KIT for testing for Free Chlorine (Cl) in your water. 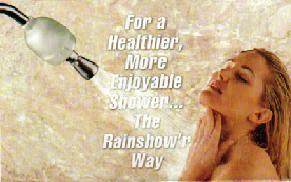 You can test your own water "before" and " after installing your Rainshow'r Shower Filter with this test kit. Crystalline Quartz technology uses specially washed, sun dried quartz to reduce surface tension of the water making it feel lighter and more energized thereby increasing the sudsing of soaps and shampoos. High quality ABS housing is engineered to be long lasting and durable. Replacement Cartridge for CQ-1000 Shower Filter with Special Order Clear Polycarbonate.